Are you a savvy businessperson or a creative visionary? Neither? Well you've come on the right place! 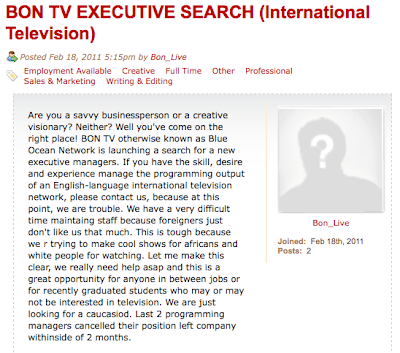 BON TV otherwise known as Blue Ocean Network is launching a search for a new executive managers. If you have the skill, desire and experience manage the programming output of an English-language international television network, please contact us, because at this point, we are trouble. We have a very difficult time maintaing staff because foreigners just don't like us that much. This is tough because we r trying to make cool shows for africans and white people for watching. Let me make this clear, we really need help asap and this is a great opportunity for anyone in between jobs or for recently graduated students who may or may not be interested in television. We are just looking for a caucasiod. Last 2 programming managers cancelled their position left company withinside of 2 months. You can come for tyring start new shows. But we can't pay while you try to start and if no starting then no pay. oNly pay for minutes on tv! but if you have good ideas on new shows you can surely success! Most of our programs are commercials. We find a sponsor to pay a program and to pay our salories and then we try to produce the program for least money. u can see samples shows at www.bonlive.com . Less jonalism and more business. We are wanting a Head of Network Programming to successfully makes and schedule our showss for broadcast internationally. If you are the one for this management roll, keep reading. The start date of this role is immediate and coincides with new channel launches in Spring 2011 on various cable, IPTV and satellite networks in North America and Asia. If you feel you qualify to take this role on, please send us your resume, and cover letter explain why you feel you are the best candidate for this role. We will contact suitable candidates for interview. 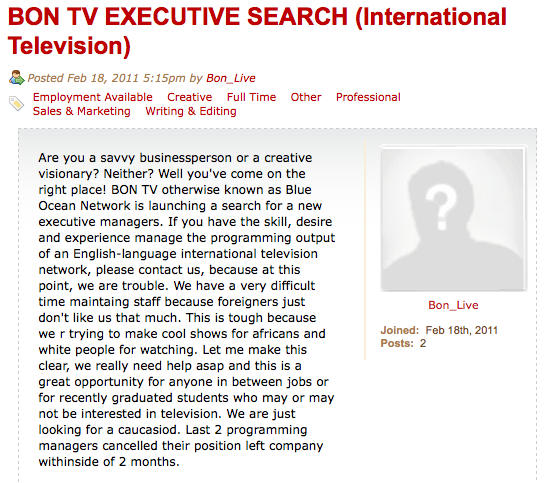 I remember my days interning at BON. The staff was ... hard-working. But I knew it wasn't going to work when they made me do daily afternoon exercises. POSTSCRIPT: If you must have a look at the original page, here it is from Google's cache. Nice article. There are good information about China Radio International. It is useful for china people. I like this kind of Blog. Thanks for admin. He is great. If anyone like to get informatics blog about China Radio International please click here.